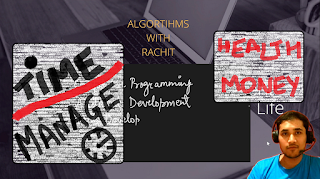 Learning Algorithms with Rachit Jain: If you are preparing for Coding Interviews, WATCH THIS! If you are preparing for Coding Interviews, WATCH THIS! Here is another video from my side: "If you are preparing for Coding Interviews, WATCH THIS!" In this video, I share what is the story behind the present hiring process for companies like Microsoft, Amazon, Goldman Sachs and then I share what are the various topics you need to study to prepare for them.